And… we’re back! After a long, refreshing, weekend without the Internet, I finally watched the latest episode of TURN:“Epiphany.” The biggest storyline of Episode 5 (well, besides the nearly perfectly-executed dramatic reveal of General Washington) brought the issue of slavery front-and-center in the TURN universe. Since this will be a recurring theme in the show, and because there’s quite a backlog of updates here at the blog, I’ll mention just a few major first impressions here. Early in the episode, when Anna Strong petitions Major Hewlett about the attainder against her husband Selah, we learn that it apparently contains mention of a “Dunmore proclamation” that frees the slaves of “suspected patriots.” Indeed, there WAS a famous (or infamous, depending on who you asked) proclamation issued by a certain Lord Dunmore, the Royal Governor of Virginia – but naturally, the real story is more nuanced than what we see on-screen. The original text of Dunmore’s Proclamation. Click to enlarge. Proclamation issued in November 1775 by the Royal Governor of Virginia (John Murray, fourth Earl of Dunmore). 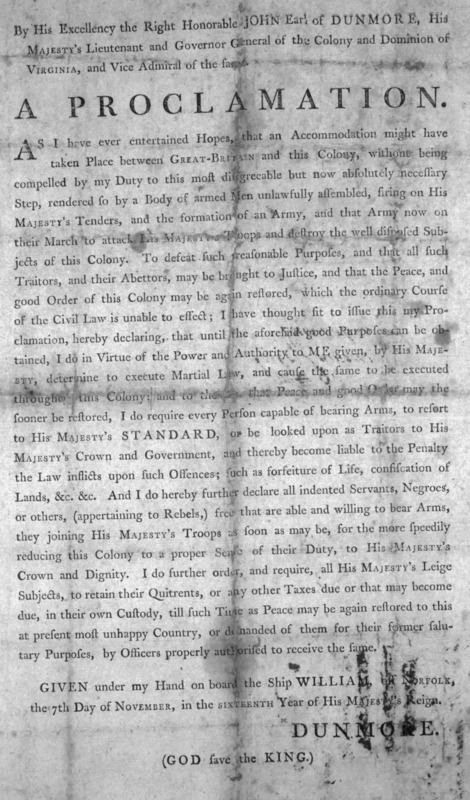 Declared martial law in the colony of Virginia. Promised slaves and indentured servants of Virginia rebels their freedom if they left their masters and took up arms in defense of the Crown (which is a pretty big “if”). Dunmore’s motivations had little to do with the morality of slavery – his primary goal was to disrupt the growing rebellion in Virginia. Dunmore’s proclamation would have no standing in New York (though it did make white slaveowners throughout the American colonies REALLY uneasy). In short: The Dunmore Proclamation wasn’t the harbinger of universal emancipation that the show might have you believe. Granted, it’s a fascinating piece of Revolutionary War history (and I encourage you to click the links above for more information), but I’m a bit confused as to why the show’s writers mentioned it at all, since its usage in TURN is both unnecessary and out of place. Major Hewlett could have simply confiscated Selah Strong’s property – including his slaves – upon “confirming” (as he says) Selah’s traitorous actions against the Crown. No additional justification would be necessary. Not to mention, anyone trying to enforce a gubernatorial edict from Virginia in New York would probably be laughed out of town. (If you think state rivalries are bad nowadays, they’re nothing compared to the late 18th century, when Americans often equated their neighboring states/colonies with foreign countries.) But hey, if this means someone learned something new about the Dunmore Proclamation today, then I’m a happy camper historian. In Episode 5, the fact that Abigail and her son Cicero can read is treated like a terrible, life-threatening secret. Some of you – faintly remembering some distant high school history lessons, perhaps –might wonder if Abigail’s worry was due to slave codes forbidding slave literacy or education. In the 18th century, New York and other northern colonies did not forbid the education of slaves – but certain southern colonies like South Carolina (which passed such laws in 1740 following a major slave rebellion) did. Since the majority of enslaved blacks in the northern colonies (and there were many) worked in households and businesses, literacy could be viewed as a beneficial trait in some cases. In other circumstances, slave literacy was encouraged in order to read and study the Bible, though this encouragement was hardly universal, even throughout the northern colonies. To be fair, no one in TURN has (yet) stated that slave literacy is a punishable offense, and there are plenty of other good reasons why an educated slave like Abigail would want to avoid drawing attention to herself or her literate son. But if you were pre-emptively wondering about the legality of slave literacy in colonial New York, there’s your answer. New York had plenty of incredibly restrictive slave laws (click here to read a list of them through the early 18th century) but a ban on slave literacy was not one of them. Also, in case you were wondering: the “BFF” vibe between Anna and Abigail is a painfully inaccurate portrayal of even the “friendliest” possible relationship between a slave and her mistress. If you felt funny watching Anna get on her knees in front of her slave, beg her for forgiveness, and tearfully ask for her advice, that’s a good indicator that your internal historical “spider sense” is working properly. That about wraps it up for this “First impressions” blog post. There’s still plenty to discuss on the thorny, complicated, and massively important topic of slavery during the American Revolution — and given Abigail’s new and extremely interesting role in TURN, I have no doubt that upcoming episodes will provide plenty of opportunities to talk about it. It’s a delicate subject to portray on TV or film, that’s for sure. What were YOUR first impressions of TURN’s inaugural venture into the subject of slavery, readers? Feel free to sound off in the comments! Site notice 1: Holy backlog, Batman! Between a multi-day absence and a misbehaving spam filter, there are an awful lot of outstanding questions and comments in the blog’s moderation queue. If you’ve submitted a question or comment lately, my apologies – I’m working on them ASAP. It’s great to see that readers’ spy-curiosity remains unabated! This entry was posted in First Impressions, Site updates and tagged abigail, anna strong, dunmore proclamation, major hewlett, selah strong, slavery, slavery in new york, slavery in the american revolution, TURN, turn amc.